What did the HITECH Act do? A new NBER working paper by David Dranove and colleagues examines some of the effects of the HITECH Act, which was intended to promote the adoption and expansion of use of electronic medical records (EMRs). 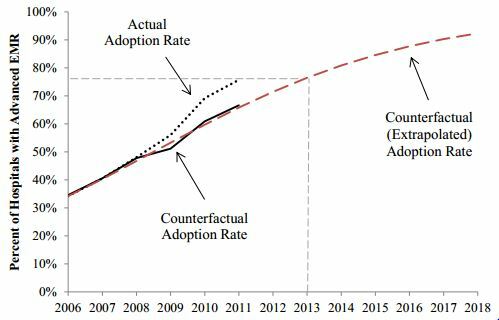 Absent HITECH incentives, we estimate that the adoption rate would have instead been 67 percent. Thus, HITECH promoted adoption among independent hospitals by an additional 10 percentage points. While this may seem like a substantial effect, when we consider that HITECH funds were available for all hospitals and not just marginal adopters, we estimate that the cost of generating an additional adoption was $48 million, which is more than enough to cover the cost of a generous EMR system. We also estimate that in the absence of HITECH incentives, the 77 percent adoption rate would have been realized by 2013, just 2 years after the date achieved due to HITECH. Their figure that shows the latter point is below.